A sharp ax is a thing of joy. When the blade strikes green wood at an angle, then lifts and sinks into the wood again, you know you are doing the work the best you can. If the ax bounces and thuds, you are in for a struggle. There’s a better way, and that’s to sharpen the ax rather than beat the log (and your arms) to smithereens with a blunt object. Chopping is a skill that can only be learned by doing. Those who don’t know better might suggest that the trail crew cut everything with a chainsaw. We live in an age of machines; surely a machine can do everything faster and more efficiently? This knuckle-dragging trail hippie begs to differ. A moderately-sized chainsaw weighs twenty pounds, must be carried on the hippie’s back, and fed gas and oil. 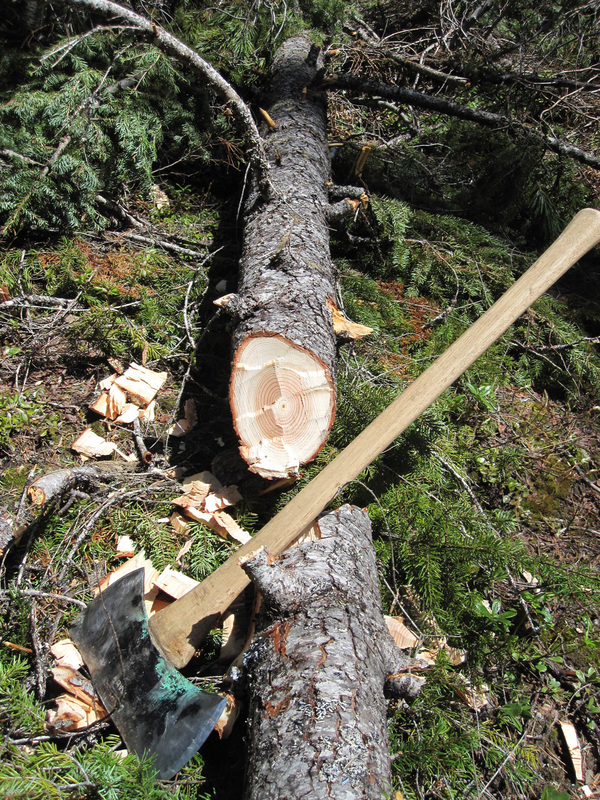 A sharp ax weighs about six pounds, requires no petroleum products, and is powered by whatever the hippie eats for lunch. For small wood, use a sharp ax, preferably one forged in the USA prior to 1980 and handled with a fine piece of ash. I’ve been chopping since childhood, but only because I was raised in the country. It was common for generations before mine to chop wood as part of every day chores. But now people have to be taught. It’s taken me a few years, but I can hit what I aim for. And it feels good. It’s fun to make the chips fly. The world might be a more peaceful place if grumpy people had to chop. Much pettiness, impatience, and road rage could be dispersed by some focused wood chopping. Keeping an ax sharp is worth the effort. The job is done faster and with less effort with a tool that has been filed to a fine edge. Because I like to chop, I also like to file. Taking care of tools completes the circle of using them in the woods. There’s a rhythm to working the blade with a file, working out the nicks. Then it’s sharp and ready to go back out on the trail.